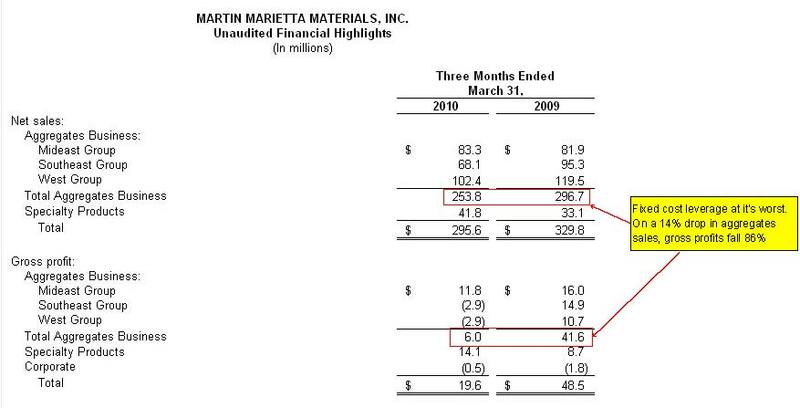 Earlier this morning, construction materials company Martin Marietta (MLM) reported a q1 loss of 54cents per share, about 20 cents worse than was expected. Higher depreciation expenses and a 56% increase in the cost of diesel hurt, while they did manage to cut costs in more discretionary areas. Shares are down 5.5%, and the conference call is later this morning. "Our operating team continued its focus on cost containment, and, consequently, our consolidated cost of sales decreased $5.3 million, or 2%, for the quarter. With the exception of depreciation, which increased $2.8 million, or 7%, and energy costs, which increased $4.2 million, or 15%, we again reduced our cost of sales in every significant category. The increase in energy costs was driven in large part by diesel expense. For the first quarter, we paid $2.03 per gallon for diesel, a 59% increase as compared with the prior-year quarter." “Based on our current economic view, we expect aggregates volume growth of 2% to 4% and aggregates pricing to range from flat to an increase of 2% compared with prior year, which should lead to increased aggregates sales and improved gross margin and profitability in 2010." While over 80% of ARRA infrastructure money in our top five states was obligated in 2009, less than 15% was actually spent. So what are the shares worth? I don't know, but you can have them. 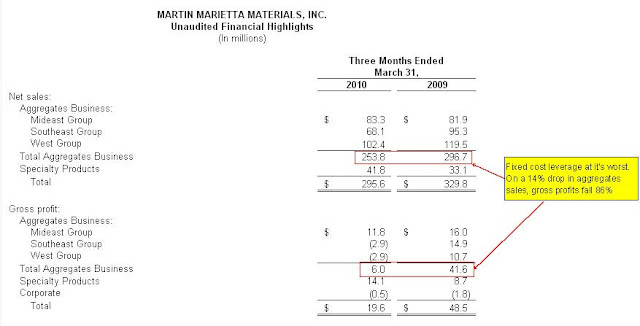 Thanks to rapid expansion, MLM hasn't produced much more than $100million in Free Cash Flow even in flush times. Even an assumption that earnings return to the $6 per share level would leave shares with a PE of 15... right now. The company's dividend yield is 1.6%...are you kidding? You can get almost 2% more than that from DJIA members Procter & Gamble and Johnson & Johnson, just to name a few. This company's previous peak results were based on "bubble-level" infrastructure spending, and I don't think the market is pricing in this risk well enough. I just heard that the shares were downgraded to SELL this morning by a bank, and I'd have to agree...stay away.